Much as I loved and played the heck out of both Car Wars and Ogre, of all the Steve Jackson microgames, it was Illuminati to which my heart truly belonged. 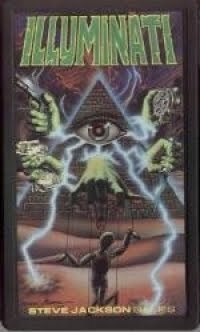 First published in 1982, Illuminati was a fast-moving -- and humorous -- card game of secret societies vying with one another for control of the world. Like all the best games, Illuminati was easy to learn and difficult to master and much of its fun came from that most unpredictable of elements -- the players themselves. Players took on the role of one of several world-spanning conspiracies, such as the Discordian Society, the UFOs, or the Servants of Cthulhu. They attempt to win the game through controlling other "lesser" organizations, from the CIA to the Boy Sprouts to Trekkies, creating a power structure through which they can amass money, power, and influence with which to control even more organizations and, of course, attack opposing conspiracies. Each conspiracy has its own goals and victory comes with achieving those goals. For example, the Gnomes of Zürich need to amass a certain amount of money to win the game, while the Bavarian Illuminati need to amass a certain of power to do so. Some goals are harder to achieve than others, but that, too, is part of the game's lasting appeal, since certain conspiracies could be considered "advanced" options for players looking for a real challenge. I say that, of all Steve Jackson's microgames, my heart belongs to Illuminati, but that doesn't mean I actually played the game as often as I played the others. Compared to Car Wars and Ogre, Illuminati isn't something you did on a lark. A typical game could take a couple of hours to complete in my experience, because the game involved lots of negotiations and deal making amongst the players, as they formed temporary alliances against one another. This aspect of the game, which I loved, tended to drag out game play and so Illuminati was one of those games you didn't just pick and play while waiting for your friends to arrive. You had to decide in advance to play Illuminati and set aside the time to do so and you needed at least four or five players to get the most out of it. An aspect of the game that my friends and I always found amusing was looking at the power structures we created through play and imagining a world where it really was the case that the UFOs controlled orbital mind control lasers who controlled the Mafia, who controlled the CIA, who controlled Hollywood, etc. Illuminati power cards were a lot of fun just to read, since, in addition to the name and humorous illustrations on them, they included game statistics, such as power, income, and resistance. Each card also had an alignment such as "liberal," "government," or "violent." Alignment played a big role in the play of the game, since it was always easier for a power group to control another group whose alignment was similar (or at least not opposed) to its own. Reading the alignments is fun too, if only to get some insight into the mind of designer Steve Jackson, whose politics and sense of humor are not always in synch with those of other gamers. Unlike the previous two SJG microgames I've discussed recently, Illuminati still appears to be available for sale, albeit in a "deluxe" format that incorporates a lot of additional rules and power groups from expansions to the original. I've never played this current version, so I can't say how close it is to the game I played in the early 80s, but I assume there's a fair degree of continuity. Consequently, you can give the game a try yourself, if you're not put off by its $34.95 price tag. I'm half-tempted to pick up a copy myself, since I no longer own my 1982 pocket box edition, but I have to admit that the price and the fact that it's an expanded edition is a bit off-putting to me. In addition to their simplicity, one of the great appeals of those microgames of old was their price and portability. A kid with limited funds could easily afford to buy them and you could carry them anywhere and play. They don't seem to make games like that anymore or, if they do, they're not as widely accessible as these microgames once were and that's a shame. The deluxe version of the game is excellent. For some years it was unavailable and the only game available was Illuminati New World Order, which was an okay game, but was a tepid substitute for the original. The expansion sets pretty much only added groups, I don't think there were any noticable rules changes, and the added groups helped balance the game. For example, there were a lot more low power groups, which made the Servants of Cthulhu more dangerous. There were more special cards added too. Illuminati remains one of the most delightful games of backstabbing and intrigue that I've ever played. The current 'deluxe' version is pretty much identical to the old deluxe version - which is the base illuminati with all its expansions except 'mind control'. So I think you'd be happy with the current deluxe game. The art however has changed, and while it's slicker and still whimsical, I still prefer to play with my original deluxe set with the black & white art for some reason I can't quite put my finger on. Forgot to mention that this is probably one of my favourite games ever. It is one of the few games has players start with unequal power yet everyone has the capacity to manipulate their way to win. It also got me to read the Illuminatus! trilogy which was a real eye-opener to a teenage boy. Illuminati was also my favourite pocket-box game, though I, too, didn't play it nearly as much as I did Car Wars. I've never played the original Illuminati, but one of the prizes of my game collection is the "One With Everything" boxed set of Illuminati: New World Order cards. I have to say, even though it cost a pretty penny for the time ($75, IIRC, in the mid-90's), it was a great investment: as you said, it's as much fun to play the game as it is to muse over the bizarre events and power structures that result from game play. The 'One With Everything' is the CCG version of Illuminati (in non-CCG form). I really liked that version as well as it did away with the fiddly money (each group has two action tokens instead), but I found it suffered from too much 'sameness' of the different alignment's powers (eg. each alignment has a +5 power booster, etc.). Still a good game, but I recommend trying the non-collectable game as well. Anyone played the derivative games - I believe there's a mobster one? Wow an Illuminati reference. I played New World Order back in the early 90's. It was a nice change from other card games we were playing at the time. Very ecclectic and weird and often humorous. Man I wonder whatever happened to my cards. I loved NWO - I'm also now trying to think of where my cards might be... I'm afraid that I never played it enough to get my mind around any sort of proper strategy or card combos. But, in all fairness, neither did any of my friends. So our games were quick & chaotic. Wow, that conspiracy site is worth a good laugh with a quick read-through. One of the more entertaining marks of a good conspiracy site is the ease with which it switches registers: from "forensic science" to "demon summoning" to "wilderness survival". It's an art form all its own. My older bro introduced me to this game on my birthday back in my teenage years. I remember being so proud of myself when I won in my very first game. I didn't play Illuminati, but this statement is very reminiscent of Diplomacy which I played a tremendous amount in the early 80's. This is also my favorite beer and pretzels game of all time. I use the original plus the various expansions (3, I think?). It is in many ways the same dynamic as Diplomacy, but faster paced, more treacherous, and funny. Diplomacy runs slightly deeper for various reasons, but Illuminati! is actually often more fun - especially if your Diplomacy players get too bogged down in negotiations. One of the Illuminati! rules, to give an idea, is that you're allowed to cheat if you don't get caught. We disallow that rule because otherwise you can't take a bathroom break, but it gives a good idea of the game's spirit. Illuminati is a great game and the new deluxe version is excellent. I have it and an earlier printing of the deluxe edition from the 90s. I too lament the death of the "micro" game. Modern pdf publishing allows for inexpensive micro style games with micro prices, but doesn't allow for the high quality portability of the old SJG and Metagame Micros. Even the Victory Point Games "micros" like Loot and Scoot (http://victorypointgames.com/details.php?prodId=120) are more expensive than the old micros -- though not by much in "inflation adjusted dollars." Never played Illuminati, but the concept reminds me of the few times we ran TSR's Tabloid game. It was fun in a ridiculous, gonzo kind of way. This is the only one of the three SJ pocket games that I still have. I want it to be buried with me (well, not really, but I do love it). NWO was the only CCG I ever loved. Regular Illuminati is still amazing. I recommend picking it back up. Played the hell out of the game in high school. Easy to learn and hard to master is an apt description - I never could win as the Servants, whose special victory condition as destroying a certain number of groups, as their condition was easy to track. OTOH, winning as the Gmones of Zurich (whose special condition was amassing a certain amount of money) was a bit too easy, which meant that once all the players knew the game, they always nailed the Gnomes to wall in fear that they were hiding reserves of cash somewhere.